Recording a full screen application with a lot of small or unlabeled options. You need to clarify what options are clicked within the recording. Click the Cursor FX tab. Click the Cursor Effects tab to view the available cursor effects. 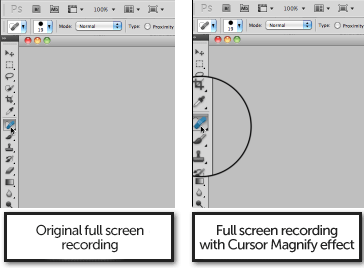 Drag the Cursor Magnify effect onto a recording file (.trec or .cmrec) on the timeline. By default, cursor effects apply to the entire duration of a recording file on the timeline. To change the duration, click the arrow on the bottom of the clip on the timeline to show the applied effects. Drag the ends of the effect to adjust the duration. Click the Properties button and then select the Cursor Properties tab to adjust the effect's properties.